All aboard the Hogwarts Express. This instantly recognisable Victorian railway viaduct at the head of Loch Shiel was first seen in Chamber of Secrets, when Ron and Harry pilot the flying Ford Anglia to Hogwarts. It's also the place where Harry encounters a Dementor for the very first time in Prisoner of Azkaban, when the Hogwarts Express stops on the bridge. This gorgeous loch near Glenfinnan was one of two lochs used as a stand-in for Hogwarts Lake in the Harry Potter films. It's the place where Buckbeak dips a toe in the water in Prisoner of Azkaban. Harry and Hermione also look out across it from the Astronomy Tower in a particularly beautiful shot at the end of Half-Blood Prince. During the filming of Prisoner of Azkaban, the crew built a replica of Hagrid's Hut beside Torren Lochan in Clachaig Gully complete with a pumpkin patch and smoking chimney. Sadly, the hut (and Hagrid) aren't there anymore, but the scenery will feel very familiar to fans. Plus you can grab a drink in the neighbouring Clachaig Inn. This bonny little island (Eilean na Moine) is the site of Dumbledore's final resting place, and where Voldemort steals the Elder Wand in Deathly Hallows Part 1. Loch Eilt is also the place where Harry and co. find Hagrid gloomily skipping stones out over the water in Prisoner of Azkaban after learning Buckbeak is to be put down. To make the location of Dumbledore's grave more scenic, Eilean na Moine was digitally added to 12-mile-long Loch Arkaig in the mountainous Great Glen. However, it is home to a pretty, non-CGI island as well: Eilean Loch Airceig, which features an atmospheric ruined chapel dedicated to St Columba. Steall Falls in Glen Nevis is the second-highest waterfall in Britain, and can usually be seen in the background during Quiddich matches, as Glen Nevis is used as the backdrop to the stadium. The falls are also the place where Harry takes on the Hungarian Horntail dragon in Goblet of Fire. Steall Falls wasn't the only location used for the dragon scene in Goblet of Fire: Harry initially hides from the Hungarian Horntail in this impressive, 120-foot deep gorge in Glen Glass not far from Evanton. The gorge is rumoured to be haunted by the ghost of a Lady Balconie, though she didn't put in an appearance during filming. Loch Morar was also used for some of the closer shots of Hogwarts Lake, and can be seen in quite a few of the aerial background shots in various films from Prisoner of Azkaban onward. The loch is the deepest freshwater body in the British Isles and is said to be home to a legendary monster named Morag. This famous and dramatic volcanic glen features in several background shots from Prisoner of Azkaban onwards, including the scene where Hermione punches Malfoy in Prisoner of Azkaban, arguably the most satisfying moment in Harry Potter history. After escaping from Gringott's Bank on the back of a dragon in Deathly Hallows Part 2, Harry, Hermione, and Ron leap into gorgeous, chilly Loch Etive and have to dry out on the shore. The gang also camp in nearby Glen Etive in Deathly Hallows Part 1: It's the spot where Hermione ties her scarf to a tree after Ron and Harry argue. Rannoch Moor, also known as the Great Moor of Rannoch, is one of the largest areas of wilderness in Scotland. It's one of several Harry Potter locations on the West Highland Line, and you can ride the sister train to the Hogwarts Express right across it. It's also the place where the Death Eaters halt and board the train in Deathly Hallows Part 1. And finally, no Harry Potter–themed trip to Scotland would be complete without a coffee at the place where it all began. 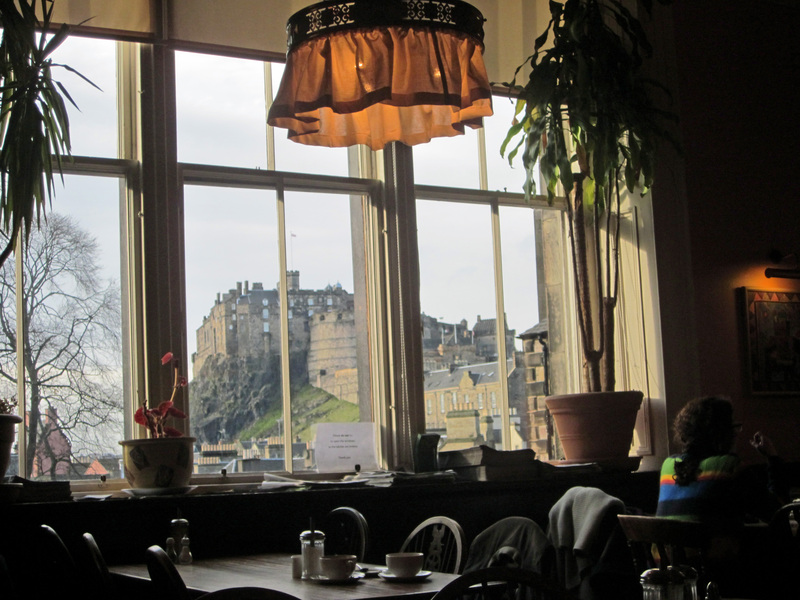 J.K. Rowling was a struggling single parent when she wrote parts of the first book in this pretty café's back room, which features this stunning view of Edinburgh Castle. Thanks for the inspiration, Elephant House. And thanks for the memories, J.K.